Unicorns + Rainbows = Love 💗💗💗 Right? Now add that to bath time and you have the best gift ever! 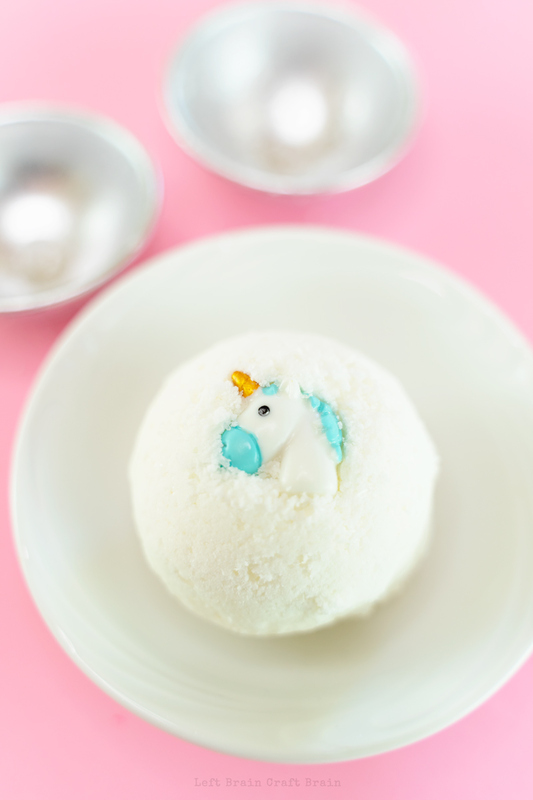 Your favorite people will love these Hidden Rainbow Unicorn DIY Bath Bombs. They start out sweet looking with a little unicorn charm. But pop them into the bath, and the rainbow appears!! There are so many reasons to make bath bombs! The first one is the biggest because I’m letting you in on a little secret. Well maybe it’s not really a secret, but it sure feels like magic. The easiest way to encourage personal hygiene in kids is with a bath bomb. 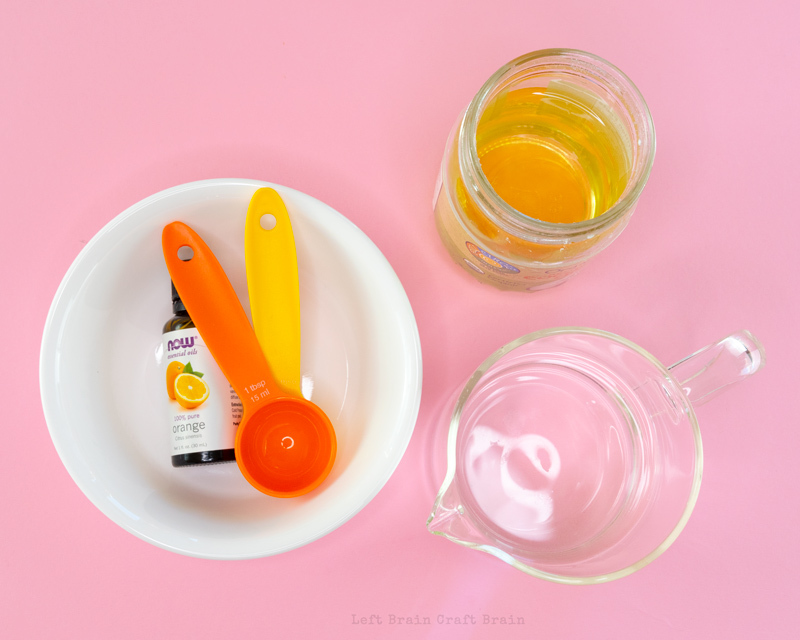 The fizz is the magic that makes them ask you “Mom, can I take a bath?” Next is it’s a really fun project to do together as a homemade DIY gift for family and friends. 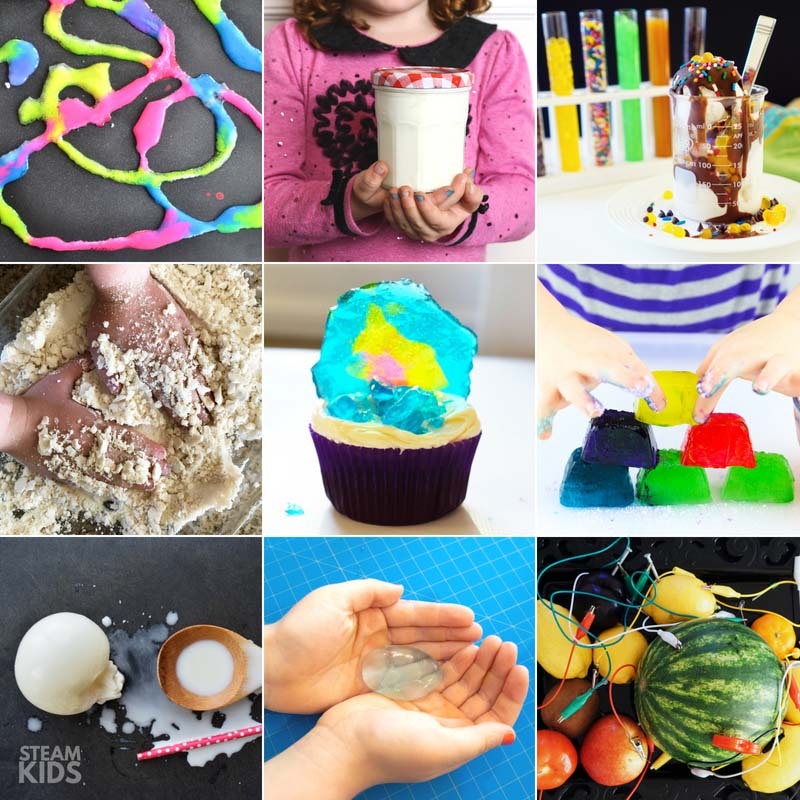 Because not just kids love bath bombs! The third is one close to my heart. It takes science to make the fizz. 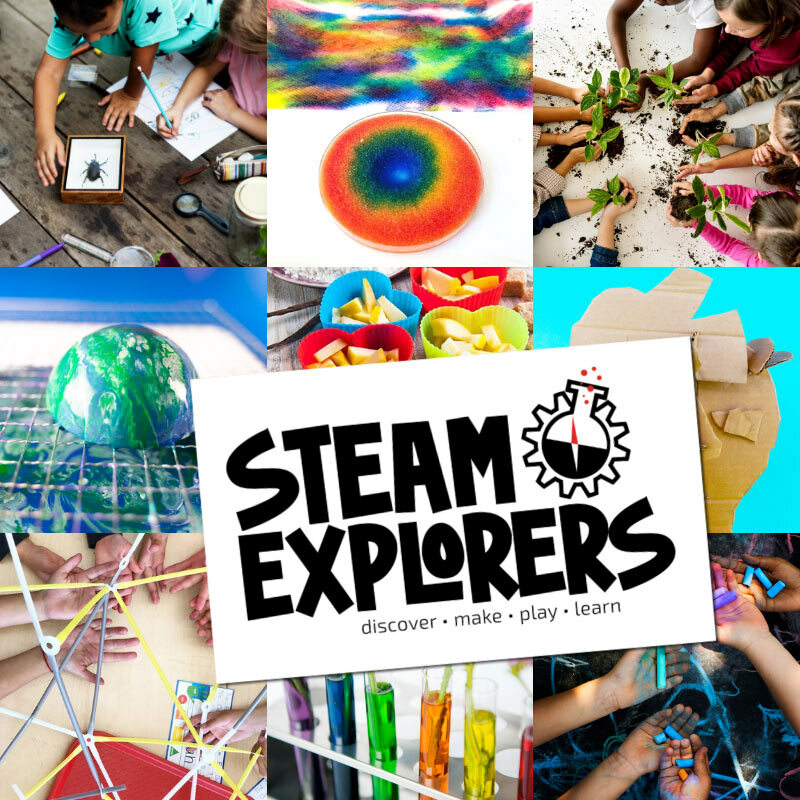 And if I can add learning into something this fun, my job is done! 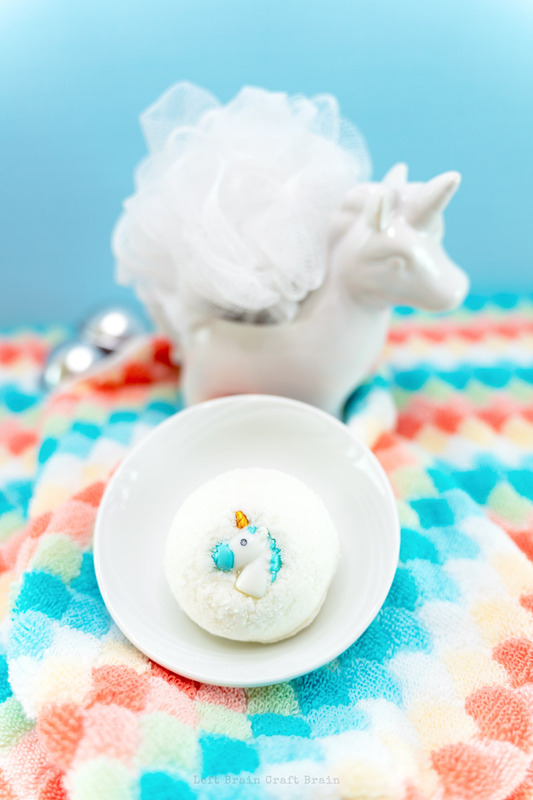 These adorable unicorn diy bath bombs use your standard bath bomb ingredients. Baking soda and citric acid for the fizz. Your favorite essential oils for the scent. Coconut oil for the moisturizing benefits. Soap colors for the rainbow. And adorable unicorn charms for the sweet! Please note, I have provided links for supplies as they are hard to find in stores and as an Amazon Associate I earn from qualifying purchases. This is at no cost to you. 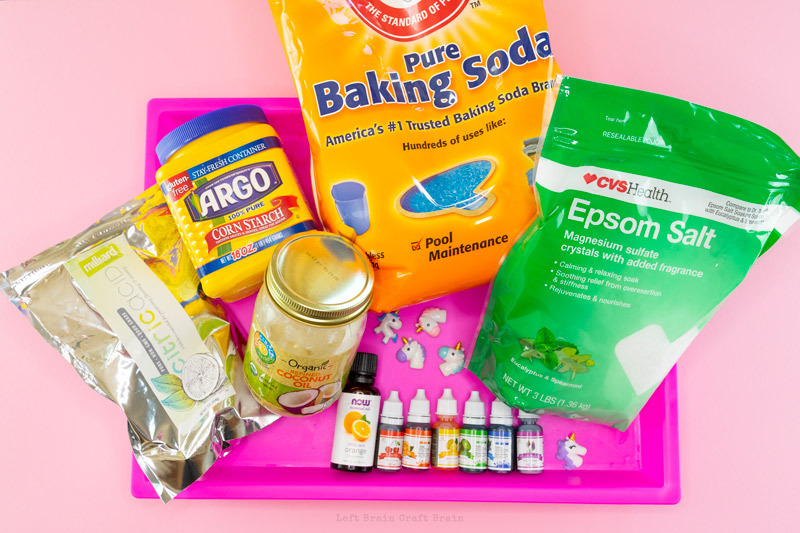 Most of the tools you’ll need for the bath bombs you can find in your kitchen. You’ll just need a bath bomb mold to make them pretty. 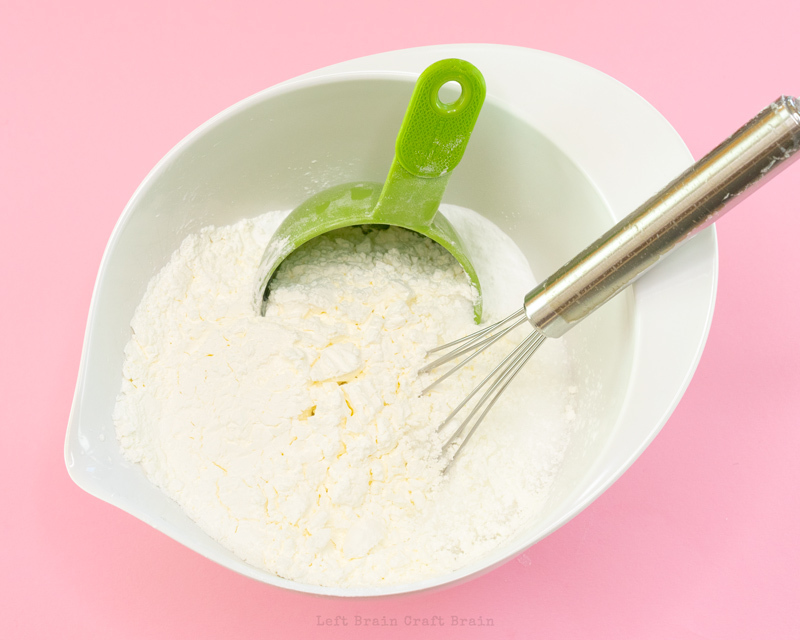 In large mixing bowl, mix baking soda, citric acid, epsom salt, and cornstarch well with a whisk. If you want super smooth bath bombs, you can sift the dry ingredients together or spin them in a food processor instead. 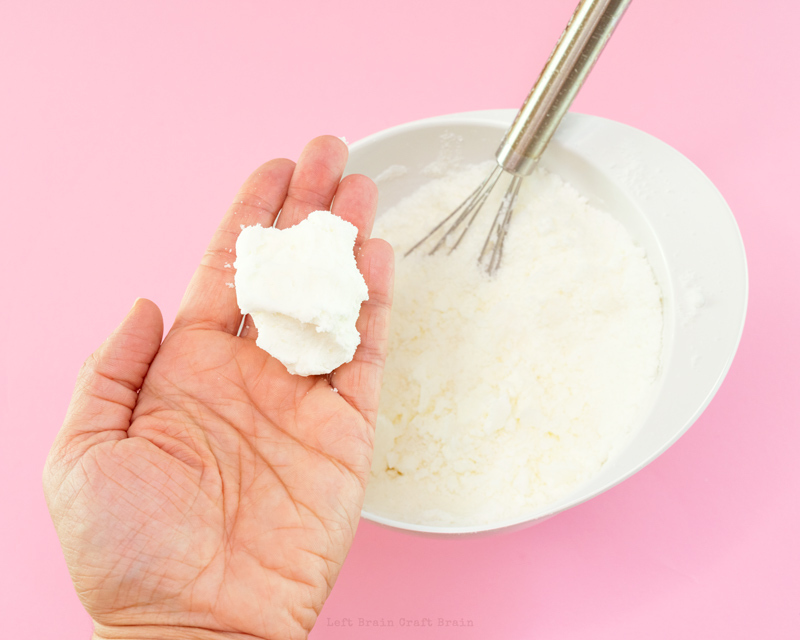 Scoop solid coconut oil into a small microwaveable bowl. Microwave for 1 minute and stir. If some solid coconut oil remains, microwave in 15 second increments until melted. Test the mixture. It should be damp, but not wet and hold together in a clump, not crumbly. If it feels dry, give it a few sprays of water from the bottle and check it again. Molding bath bombs is a spot where practice makes perfect. 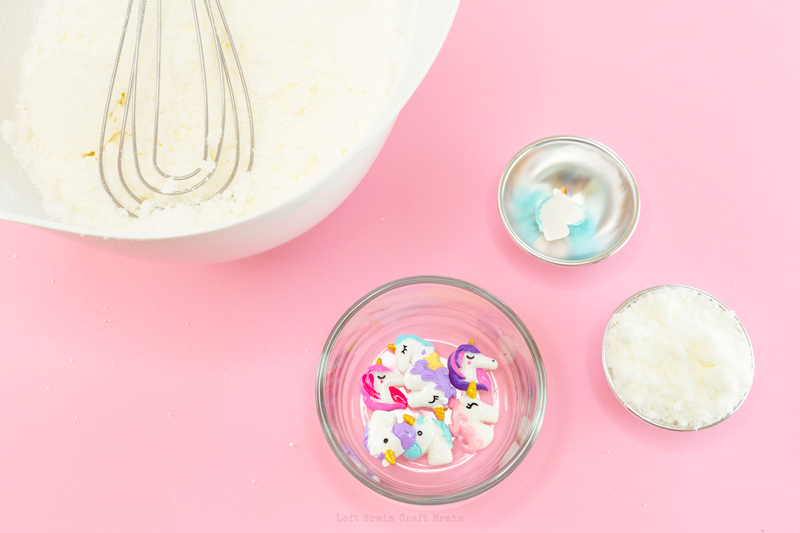 You can try making a few all white bath bombs first to try out the method and then crumble them back into the bowl to make the hidden rainbow version. Now grab your bath bomb mold. I used metal molds but you can also use the plastic ones that make great containers for gifting the bombs. Place a unicorn charm, design side down, in one of the halves of the mold. Then fill with the powder mixture. Then add you colors by placing a circle of soap colors in the middle of the powder. I used two drops per color. Don’t add too much or it will leak out the sides. Cover gently with a bit of bomb mixture until you can’t see the colors anymore. Fill the other half of the mold with the bath bomb mixture and press both sides together. You want the mixture to be slightly loose before you press together the mold or you might have trouble getting it out. Repeat until you run out of powder mixture (or bomb molds). Let bombs dry in mold for 30 minutes, then remove. You can brush off any extra bomb mixture that’s covering the unicorn. Let dry overnight before using. Now on to the fun part!! 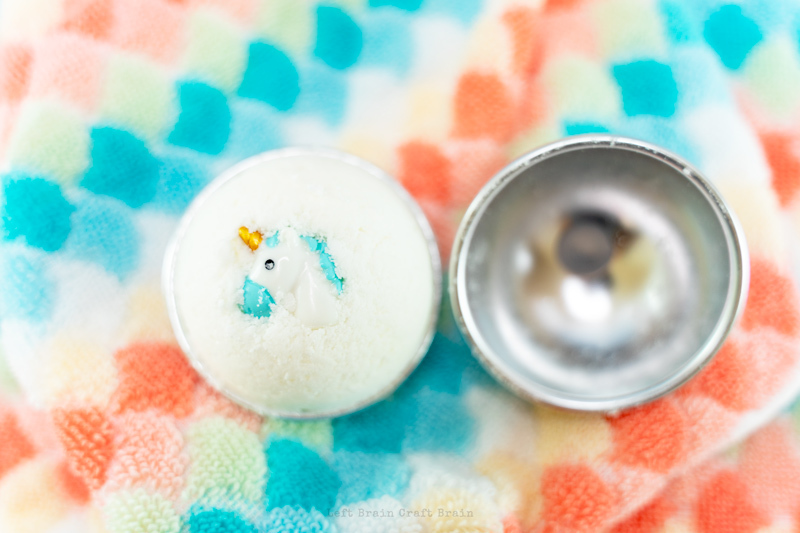 Run a bath, hop in, and drop in your hidden rainbow unicorn DIY bath bomb! And watch the colors appear. One of the things I love about these bath bombs is that every one is different. You never know which colors will appear first! Please note… These bath bombs contain oils and lots of color, so I recommend giving the bath tub a wipe when you get out. Prevents slips and color staining. See the Hidden Rainbow Unicorn Bath Bombs in Action! Ever wondered what makes bath bombs fizz? It’s science! The bubbles come from a chemical reaction between the citric acid (C6H8O7)and the baking soda (NaHCO3, a base called sodium bicarbonate). The reaction starts when the bath bomb gets wet and the reactants are allowed to come in contact. When they react, they combine to create sodium citrate (Na3C6H5O7) + water (H2O) + carbon dioxide (CO2). It’s the carbon dioxide that offgasses as bubbles, giving you that fizz. 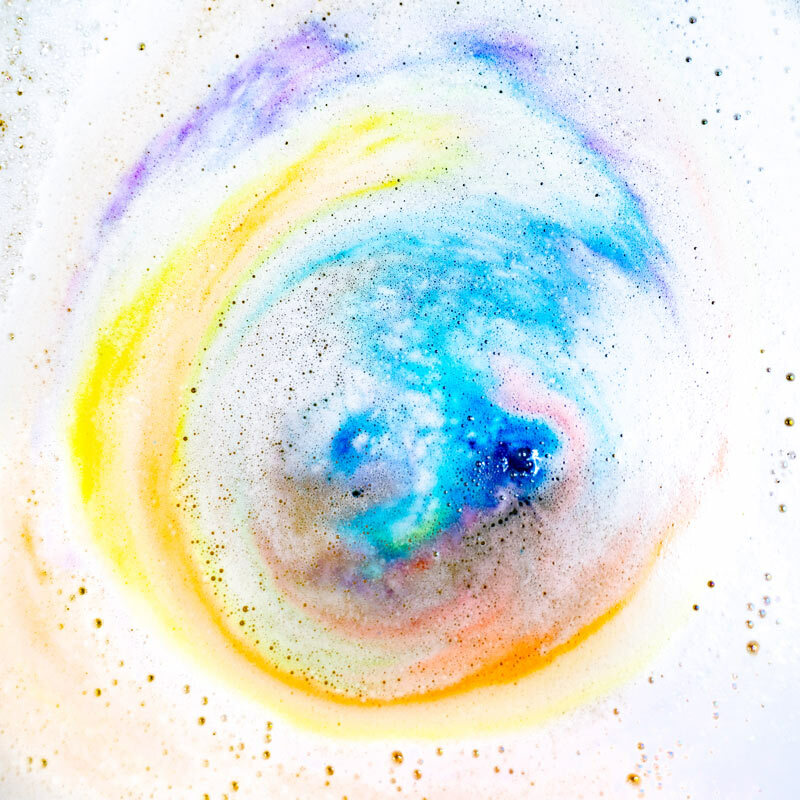 Adjusting the amount of cornstarch in a bath bomb controls how fast the reaction takes place because it interferes with the contact between the citric acid and baking soda. 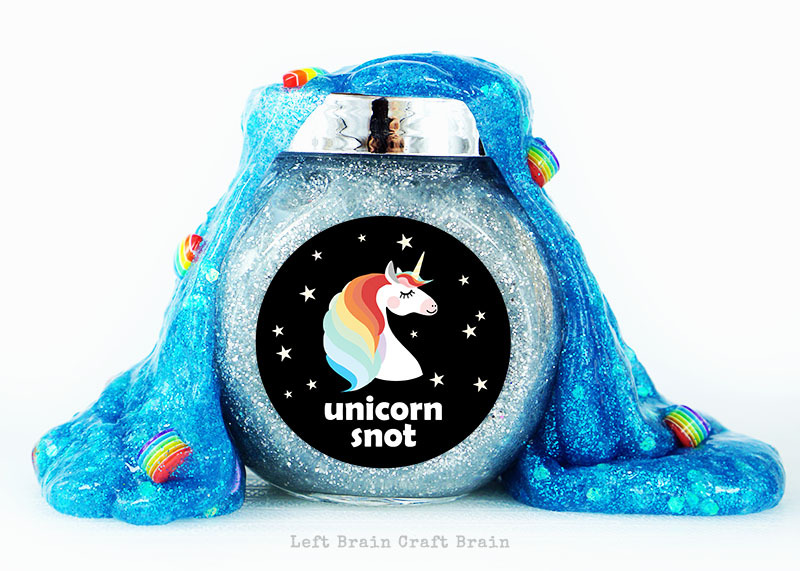 If your kids love unicorns as much as mine, definitely give these activities a try! 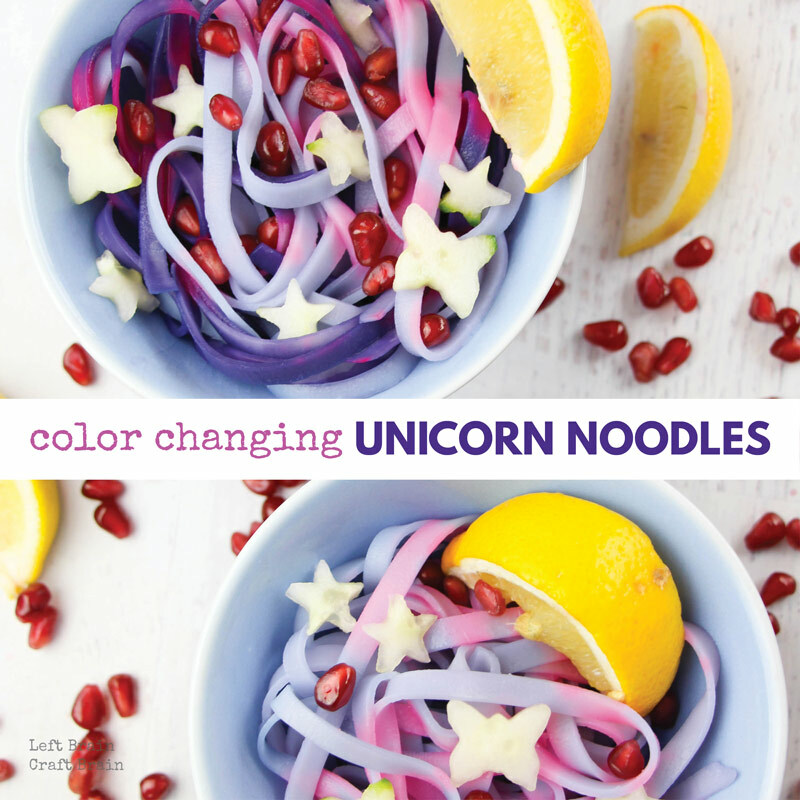 Magical color changing unicorn noodles use a bit of science to create their gorgeous pink and purple colors. 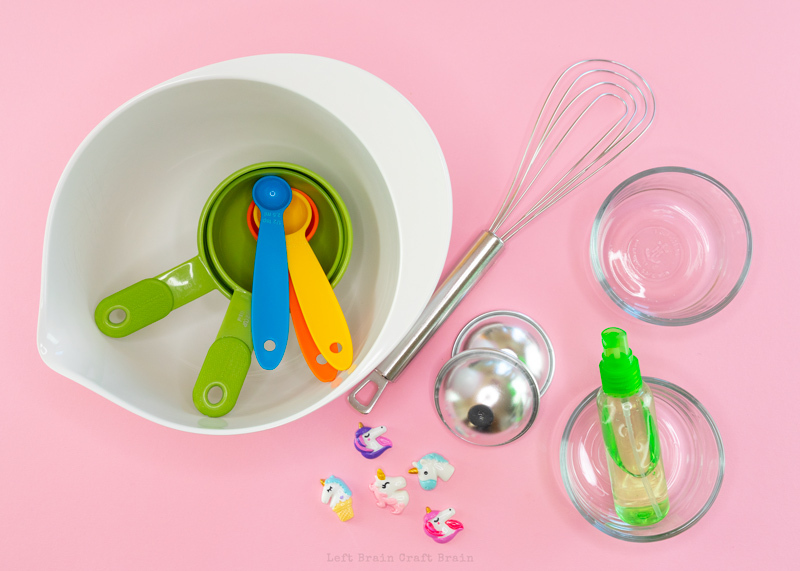 So add a little magic and learning to your next mealtime! 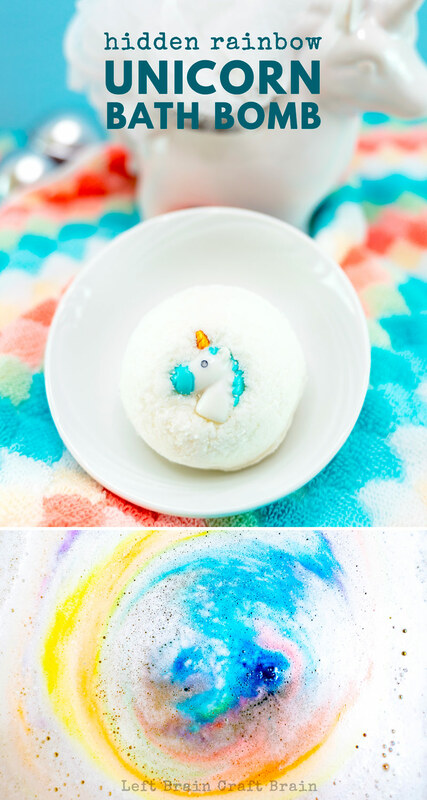 Bath time reveals a colorful surprise in these sweet Hidden Rainbow Unicorn DIY Bath Bombs. Now grab your bath bomb mold. Place a unicorn charm, design side down, in one of the halves of the mold. Then fill with the powder mixture. Molding bath bombs is a spot where practice makes perfect. 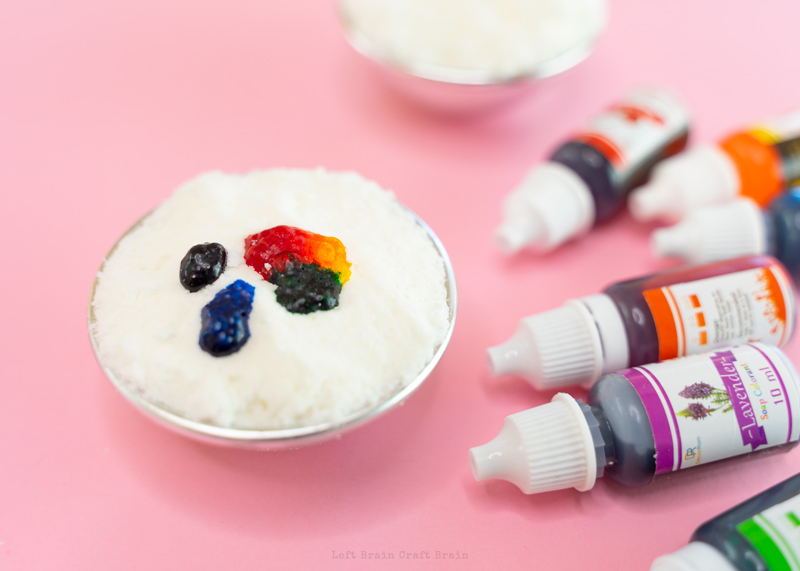 You can try making a few all white bath bombs first to try out the method and then crumble them back into the bowl to make the hidden rainbow version. Then add you colors by placing a circle of soap colors in the middle of the powder. I used two drops per color. Don't add too much or it will leak out the sides. Cover gently with a bit of bomb mixture until you can't see the colors anymore. Let bombs dry in mold for 30 minutes, then remove. You can brush off any extra bomb mixture that's covering the unicorn. Let dry overnight before using. Now on to the fun part!! 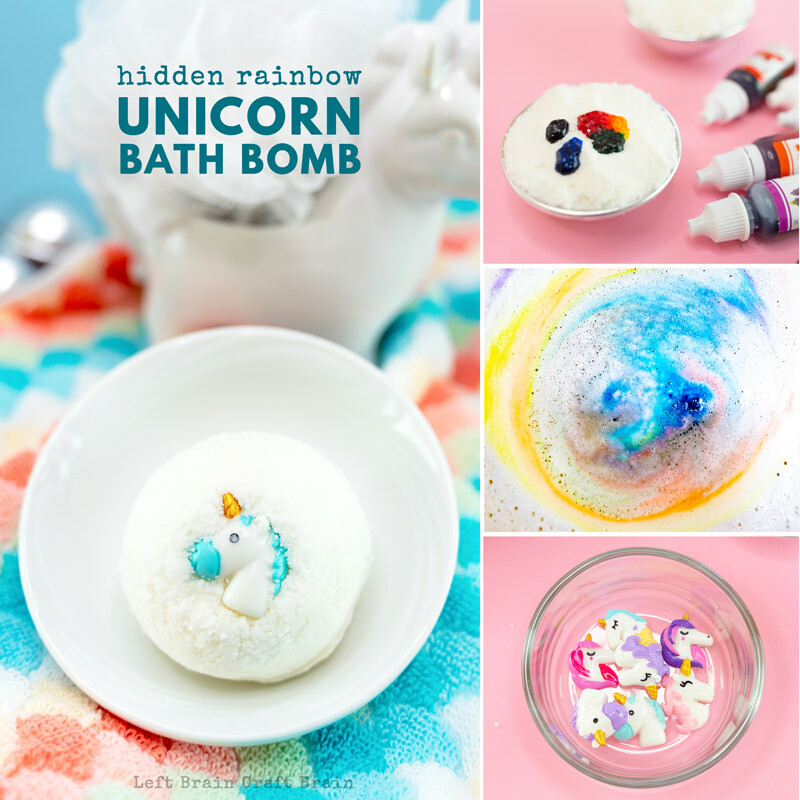 Run a bath, hop in, and drop in your hidden rainbow unicorn DIY bath bomb! And watch the colors appear. Please note... These bath bombs contain oils and lots of color, so I recommend giving the bath tub a wipe when you get out. Prevents slips and color staining.